If you are planning to install a tow bar on your vehicle, then you need to know what GVM is from GCM. Fear not, we have put together essential information that will serve you handy. GVM (Gross Vehicle Mass) – The GVM is the maximum allowable total mass of a fully loaded motor vehicle, consisting of the tare mass (mass of the vehicle) plus the load (including passengers). GCM (Gross Combination Mass) – GCM is the rating provided by the manufacturer of the tow vehicle. The maximum laden mass of a motor vehicle plus the maximum laden weight of an attached trailer is not permitted to exceed the GCM rating. ATM (Aggregate Trailer Mass) – The total laden weight of a trailer, which includes the tow ball mass and whatever you add as payload (water, gas, luggage). The ATM is speciﬁed by the trailer manufacturer and must not be exceeded. GTM (Gross Trailer Mass) -The total permissible mass which includes whatever you add as payload (water, gas and luggage) that can be supported by the wheels of a trailer. This does not include the mass supported by the tow ball. Tare Mass – The unladen weight of the complete new trailer as delivered (including any options ﬁtted). Tow Ball Mass – The weight imposed on the tow vehicle’s tow ball by the coupling. Payload -The maximum payload is speciﬁed by the manufacturer. It must not be exceeded under any circumstances. Safety, insurance and warranty may be affected if the speciﬁed payload is exceeded. Fitting load levelling devices, also known as weight distributing hitches or level rides. Fitting 12 volt electrical connection: a seven pin electrical connector (which is compulsory in Australia) provides the electrical power to operate the trailer lights as well as the electric brakes that are ﬁtted to most caravans. Twelve-pin plugs are also allowable. Fitting a suitable brake controller and connection: all trailers of 750kgs GTM or more must be ﬁtted with brakes. 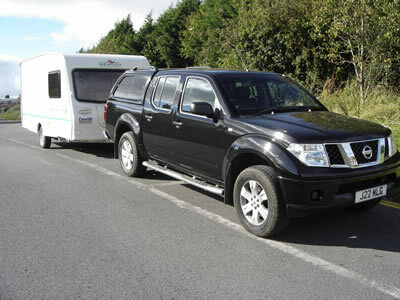 Electric brakes are the most commonly used and require a brake controller, with appropriate connections to the trailer, to be ﬁtted in the tow vehicle. Extra mirrors may need to be added to the tow vehicle when towing large trailers. It is a legal requirement that the driver has a clear and unobstructed view of the road to the rear of the vehicle or vehicle combination at all times. Fitting an extra transmission oil cooler for vehicles with automatic transmission. These are standard on some late model vehicles. For more information on your tow bar or if you have any questions, don’t hesitate to call one of our experts at Tow Bar Pro!